Proprietary Name: Rite Aid Tooth And Gum Pain Relief Cushions What is the Proprietary Name? 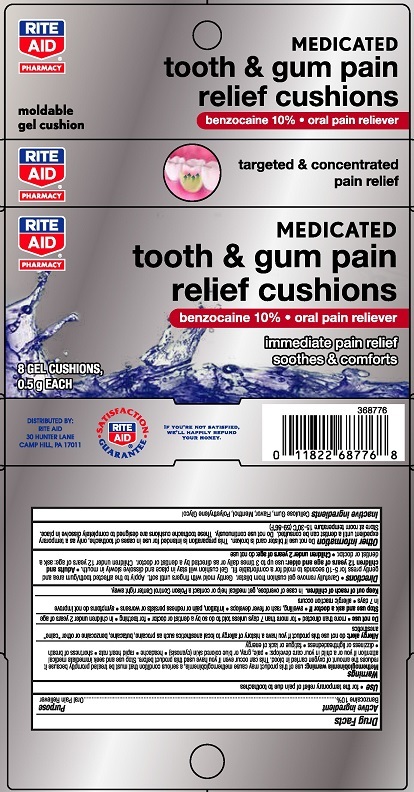 Rite Aid Tooth And Gum Pain Relief Cushions with NDC 11822-6035 is a a human over the counter drug product labeled by Rite Aid. The generic name of Rite Aid Tooth And Gum Pain Relief Cushions is benzocaine. The product's dosage form is strip and is administered via topical form. DirectionsCarefully remove gel cushion from blister. Gently mold iwth fingers until soft. Apply to affected tooth/gum area and gently press for 5-10 seconds to mold for a comfortable fit. Gel cushion will stay in place and dissolve slowly in mouth.Adults and children 12 years of age and older: use up to 3 times daily or as directed by dentist or doctor.